Control circuits - grounded or ungrounded? In the case of electrical machines, this applies to the control circuits and auxiliary circuits as well as to the main circuits. In main circuits, the most important aspects are protection against electric shock, protection of persons and fire prevention. In control circuits and auxiliary circuits, especially those with voltages below the permissible touch voltage of AC 50 V/DC 120 V, the focus is on operational safety. According to DIN EN 60204-1/VDE 0113-1, ground faults in control circuits must not lead to unintended start-ups or hazardous machine motions and they must not prevent the machine from shutting down. Generally, control circuits are supplied via an isolating transformer with separate windings or a separate power supply unit, considering that the secondary voltage must not exceed 50 V.
The control circuit itself may be operated as a grounded system (TN system) or an ungrounded system (IT system). However, unknown high-resistance ground faults may cause controller faults, especially in the sensitive components of a control circuit. In a grounded system, these faults are not detected by a fuse since the fault current is too low to trigger the fuse. If the ground fault has a low resistance, the fuse trips and the installation stops. To avoid this, control circuits are operated in ungrounded systems and monitored via an ground-fault monitoring device. Due to dirt, dust or moisture e.g. on limit switches, symmetrical ground faults may occur in control circuits, which may then prevent the installation from being shut down or cause uncontrolled start-ups. Symmetrical ground faults are resistive faults of the insulation of an electrical installation or device where all line conductors have approximately the same resistance to ground. 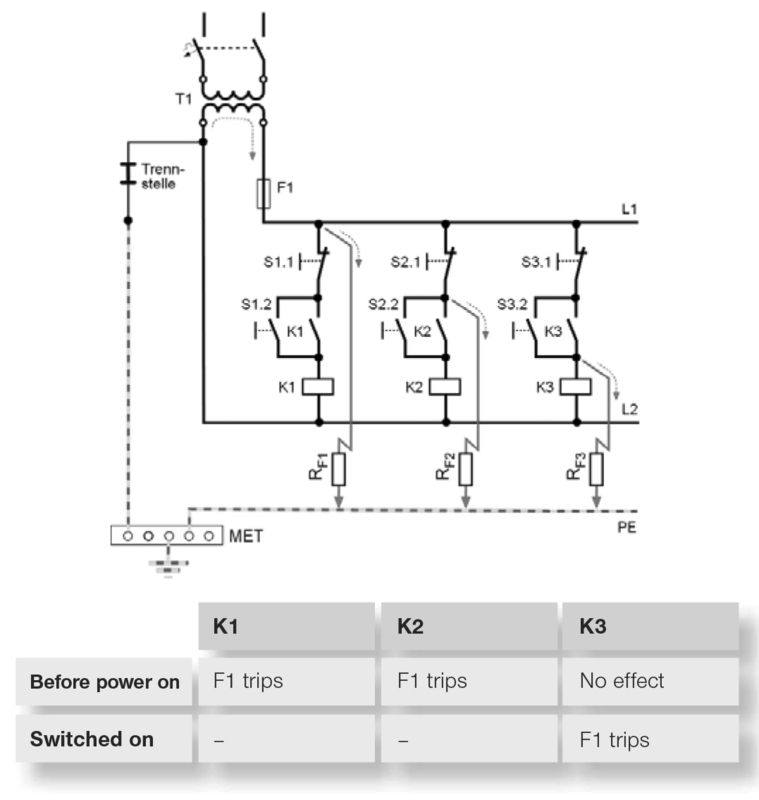 In this case, two high-resistance ground faults on sensitive control inputs are enough to "set" the input. These faults do not cause the overcurrent protective device to trip since the fault current is noticeably below the required short-circuit current. Residual current devices also can't help since the forward and reverse currents are identical and therefore no residual current is generated. When selecting the corresponding ground-fault monitoring device it should be ensured that it is capable of detecting symmetrical ground faults. 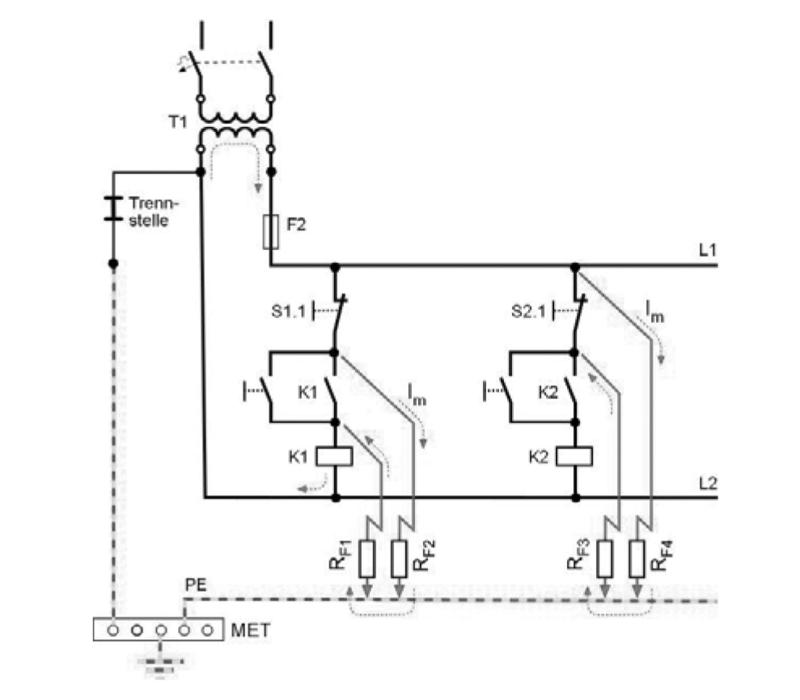 Ground-fault relays that measure the displacement voltage to ground as an evaluation criterion do not fulfill this requirement from a measuring principle point of view. 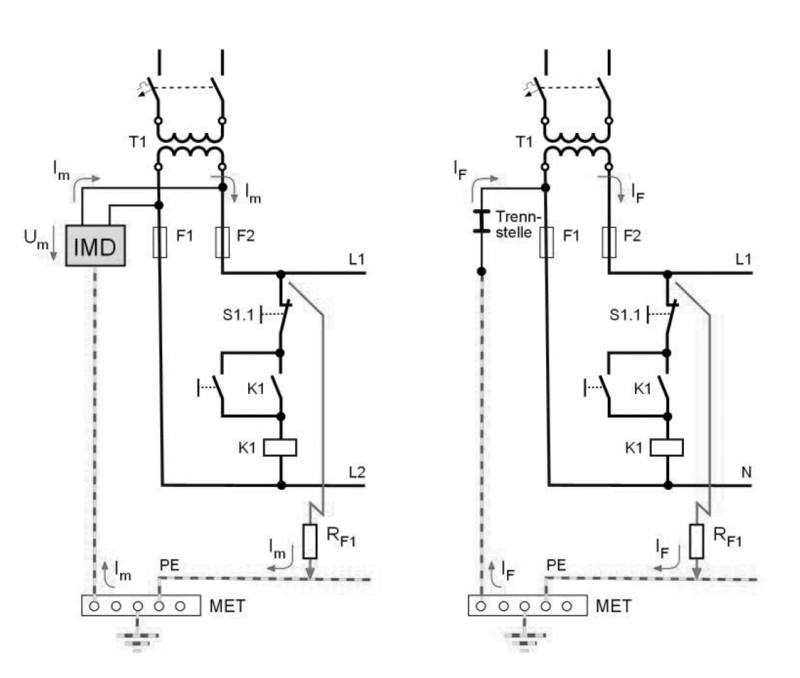 A standard-compliant version of control circuits does not necessarily have to be grounded. Especially when considering the aspects of operational safety, failure prevention and cost reduction, ungrounded control circuits with ground-fault monitoring are often the better choice. Ground-fault location systems can be used as a complement to indicate where the ground fault is located during operation. Which measure is finally taken has to be determined within a risk analysis.